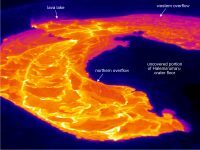 This past week, Kīlauea Volcano’s summit lava lake level fluctuated with summit inflation and deflation, eventually rising high enough to overflow onto the floor of Halemaʻumaʻu multiple times beginning Saturday, April 21. On the East Rift Zone, the 61g lava flow remained active with breakouts on the upper part of the flow field. There were no active lava flows on the pali, coastal plain, or entering the ocean. The 61g flows do not pose an immediate threat to nearby communities. Mauna Loa is not erupting. Rates of deformation and seismicity have not changed significantly over the past week. Few small-magnitude earthquakes occurred beneath the summit and upper flanks of the volcano, primarily at depths shallower than 5 km (3 mi). GPS and InSAR measurements indicate slowing deformation related to inflation of a magma reservoir beneath the summit and upper Southwest Rift Zone. Two earthquakes with three or more felt reports occurred in Hawaii this past week: a magnitude-2.7 earthquake 3 km (2 mi) northwest of Keokea at 28.0 km (17.4 mi) depth on April 21 at 3:34 p.m. HST and a magnitude-3.2 earthquake 5 km (3 mi) south of Volcano at 1.8 km (1.1mi) depth inside Hawai`i Volcanoes National Park on April 26 at 1:08 p.m. HST.